This second release by Reuben Son for Private Chronology strays from the minimalism and restraint previously exercised. Side A provides a slice of tape-garble sourced largely from a crudely played electric guitar. 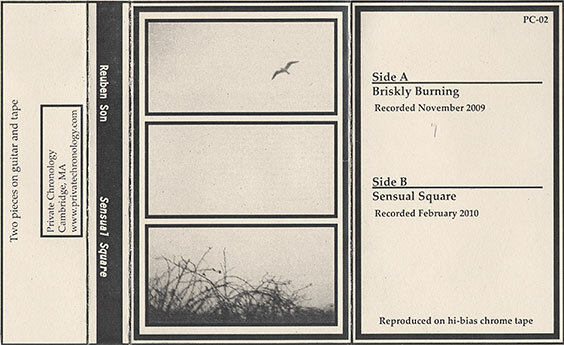 Side B is something else entirely, an almost melodramatic guitar jaunt incorporating a previously recorded tape piece and locational sounds (floated in from an open window). Hand-assembled edition of 100 by the artist, with labels scrawled onto painted cassette shells by fingerpick.
" ... Reuben's vision is proving to be one of the more singular amidst these pages ; criminal he's only been able to get out these small-run tapes thusfar ... but then again, we should all be grateful that we're even granted access to his inner sanctum ... Highly Recommended !!!" "... Totally cryptic and totally magnificent .."